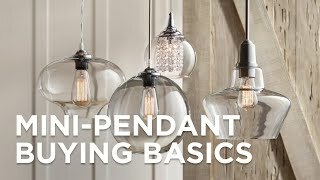 You can't go wrong with the combination of clear glass and an aged brass finish in the Anya mini pendant by Hudson Valley. Slim and minimalist, the Anya mini pendant from Mitzi collection shows off a translucent design with clear glass. Designed by Hudson Valley, an aged brass finish lends a glamorous air to this modern pendant. Invite a fabulous, contemporary vibe to any hallway or kitchen by hanging these in a series. BEST ANSWER: Hi - yes, this is slope adaptable with the flexible cord. This fabulousvintage style rust metalsingle-light mini pendant will add a chicendearing touch to any space.